Natural gas rate schedules are similar in structure to electric rate schedules, but they are often much simpler. Natural gas companies also experience a peaking problem. Theirs is likely to occur on very cold winter days and/or when supply disruptions exist. Due to the unpredictable nature of these peak problems, gas utilities normally do not charge for peak demand. Instead, customers are placed into interruptible priority classes. A customer with a high priority will not be curtailed or interrupted unless absolutely necessary. A customer with the lowest priority, however, will be curtailed or interrupted whenever a shortage exists. Normally some gas is supplied to keep customer's pipes from freezing and pilot lights burning. To encourage use of the low-priority schedules, utilities charge significantly less for this gas rate. Most gas utilities have three or four priority levels. Some utilities allow customers to choose their own rate schedule, while others strictly limit the choice. Figure 3-12 presents a sample rate schedule for four priority levels. Here the industrial customer is limited in choice to priorities 3 and 4. Summer periods include the months from May through October. Winter periods include the months from November through April. Figure 3-12. Gas schedules for one utility. electric rates, fuel cost adjustments do exist in gas rates. Sales taxes also apply to natural gas bills. Again, some states do not charge sales tax on gas used directly in production. Natural gas rates differ significantly in different parts of the country. Gas is relatively cheap in the producing areas of Oklahoma, Texas and Louisiana. It is much more expensive in other areas where it must be transported over long distances through transmission pipes. For example, in Florida, gas is almost twice as expensive as shown in the rate structure of Figure 3-12. Gas supplied by Gainesville Regional Utilities (Gainesville, FL) is priced under a flat rate structure (i.e. it does not drop in price with increased use). It costs around $6.00/Mcf for residential use, and almost $5.00/Mcf for commercial use. Interruptible gas service for larger users costs about $4.00/Mcf. Fuel oils are a very popular fuel source in some parts of the country, but they are rarely used in others. Natural gas and fuel oil can generally be used for the same purpose so the availability and price of each generally determines which is used. Fuel oils are classified as distillates or residuals. This classification refers to the refining or distillation process. Fuel oils Number 1 and 2 are distillates. No. 1 oil can be used as a domestic heating oil and diesel fuel. No. 2 oil is used by industry and in the home. The distillates are easier to handle and require no heat to maintain a low viscosity; therefore, they can be pumped or poured with ease. Residual fuel oils include Nos. 4, 5 and 6. Optimum combustion is more difficult to maintain with these oils due to variations in their characteristics that result from different crude oil origins and refining processes. No. 6 or residual bunker C is a very heavy residue left after the other oils have been refined. It has a very high viscosity and must be heated in cold environments to maintain a pour point (usually somewhere around 55°F). The sulfur content of fuel oil normally ranges from .3 to 3.0 percent. Distillates have lower percentages than residuals unless the crude oil has a very high sulfur level. Sulfur content can be very important in meeting environmental standards and thus should be watched carefully. Billing schedules for fuel oils vary widely among geographical areas of the country. The prices are set by market conditions (supply vs. demand), but within any geographical area they are fairly consistent. Within each fuel oil grade, there is a large number of sulfur grades, so shopping around can sometimes pay off. Basically, the price is simply a flat charge per gallon, so the total cost is the number of gallons used times the price per gallon. Like fuel oil, coal comes in varying grades and varying sulfur content. It is, in general, less expensive than fuel oil per Btu, but it does require higher capital investments for pollution control, coal receiving and handling equipment, storage, and preparation. Coal is priced on a per ton basis with provisions for or consideration of sulfur content and percent moisture. Finally, coal does not burn as completely as other fuels. If combustion air is properly controlled, natural gas has almost no unburned combustibles, while fuel oil has only a small amount. Coal, however, is much more difficult to fully combust. In some areas of the country, customers can purchase steam and chilled water directly instead of buying the fuel and generating their own. This can occur where there are large-scale cogeneration plants (steam), refuse-fueled plants (steam), or simple economics of scale (steam and/or chilled water). In the case of both steam and chilled water, it is normal to charge for the energy itself (pounds of steam or ton-hours of chilled water) and the demand (pounds of steam per hour or tons of chilled water). A sample hypothetical rate schedule is shown in Figure 3-13. These rates are often competitive with costs of self-generated steam and chilled water. Purchasing steam and chilled water conserves considerable amounts of capital and maintenance monies. In general, when steam or chilled water is already available, it is worthy of consideration. The primary disadvantage is that the user does not have control of the generating unit. However, that same disadvantage is also true of electricity for most facilities. The energy analyst also frequently looks at water and wastewater use and costs as part of the overall energy management task. These costs are often related to the energy costs at a facility, and are also amenable to cost control. Water use should be examined, and monthly bills should be analyzed similarly to energy bills to see if unusual patterns of consumption are occurring. Water treatment and re-use may be cost effective in areas where water costs are high. Figure 3-13. Hypothetical steam and chilled water rate schedule. returning water to the sewer system. This can reduce the wastewater charges by up to two-thirds. Once the energy rate structures have been examined, management should now understand how the company is being charged for the energy it uses each month. This is an important piece of the overall process of energy management at a facility. The next step in the examination of energy costs should be to review the bills and determine the average, peak and off-peak costs of energy used during at least the past twelve months. Energy bills should be broken down into components that can be controlled by the facility. These cost components can be listed individually in tables and then plotted. For example, electricity bills should be categorized by demand costs per kW per month, and energy costs per kWh. The following example illustrates this analysis for an industry in Florida. Example 3-2. A company in central Florida that fabricates metal products receives electricity from its electric utility at the following general service demand rate structure. Fuel adjustment = A variable amount per kWh each month (which may be a cost or a credit depending on actual fuel costs to the utility). The electric energy use and costs for that company for a year are summarized below. The energy analyst must be sure to account for all the taxes, the fuel adjustment costs, the fixed charges, and any other costs so that the true cost of the controllable energy cost components can be determined. In the electric rate structure described above, the quoted costs for a kW of demand and a kWh of energy are not complete until all these additional costs are added. Although the rate structure says that there is a basic charge of $6.50 per kW per month, the actual cost including all taxes is $7.02 per kW per month. The average cost per kWh is most easily obtained by taking the data for the 12-month period and calculating the cost over that period of time. Using the numbers from the table, one can see that this company has an average energy cost of ($42,628.51)/(569,360 kWh) = $0.075 per kWh. The utility cost data are used initially to analyze potential Energy Management Opportunities (EMOs) and will ultimately influence which EMOs are recommended. For the example above, an EMO that reduces peak demand would save the company $7.02 per kW per month. Therefore, the energy analyst should consider EMOs that would involve using certain equipment during the night shift when the peak load is significantly lower than the first shift peak load. EMOs that save both energy and demand on the first shift would save costs at a rate of $0.075 per kWh. Finally, EMOs that save electrical energy during the off-peak shift should be examined too, but they may not be as advantageous; they would only save at the rate of $0.043 per kWh because they are already using off-peak energy and there would not be any additional demand cost savings. The energy consumption should be plotted as well as tabulated to show the patterns of consumption pictorially. The graphs often display some unusual feature of energy use, and may thus help highlight periods of very high use. These high-use periods can be further examined to determine whether some piece of equipment or some process was being used much more than normal. The energy auditor should make sure that any discrepancies in energy use are accounted for. Billing errors can also show up on these plots, although such errors are rare in the authors' experience. 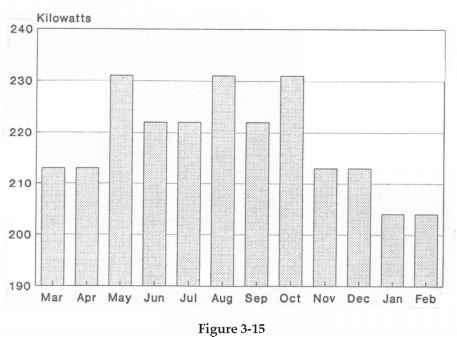 Figures 3-14 and 3-15 show graphs of the annual kilowatt-hour and kilowatt billing for the data from the preceding example. 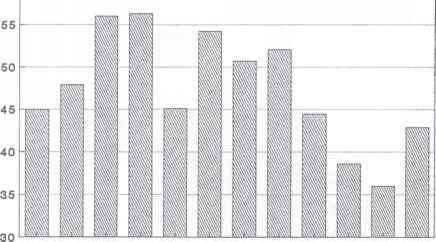 An energy auditor examining these graphs should ask a number of questions. Because the months of May through October are warm months in Florida, the kilowatt-hour use during these months would be expected to be higher than during the winter months. However, July shows unexpectedly low usage. In this case the company took a one-week vacation during July, and the plant energy consumption dropped accordingly. In other cases, this kind of discrepancy should be investigated, and the cause determined. The variations between December, January and February again bear some checking. In this example, the plant also experienced shutdowns in December and January. Otherwise, the facility's kilowatt-hour use seems to have a fairly consistent pattern over the twelve-month period. Kilowatt use also needs some examination. The 18 kW jump from April to May is probably the result of increased air-conditioning use. However, the 9 kW drop from May to June seems odd especially since kilowatt-hour use actually increased over that period. One might expect demand to drop in July commensurate with the drop in energy use, but as long as the plant operated at normal capacity on any day during the month of July, it would be likely to establish about the same peak demand as it did in June. Other causes of large variations for some facilities can be related to meter reading errors, equipment and control system malfunctions, and operational problems. equipment with more efficient models; adding insulation to walls and ceilings; replacing motors with high efficiency models and using variable speed drives; recovering heat from air compressors, refrigeration units, or production processes to heat water for direct use or to pre-heat water for steam production; and replacing manufacturing or process equipment by more energy efficient models or processes. Most of these actions will also result in demand reductions and produce savings through lower kW charges. Other actions that specifically reduce demand involve controlling and scheduling existing loads to reduce the peak kW value recorded on the demand meter. An energy management computer that controls demand is usually better than manual control or time-clock control. If several large motors, chillers, pumps, fans, furnaces or other high kW loads are in use at a facility, then electric costs can almost always be saved through demand limiting or control. All of these areas for savings will be examined in detail in the subsequent chapters. Example 3-3. As an example of the savings that can be obtained by demand control, consider the use of four large machines at a production facility where each machine has a demand of 200 kW. The machines could be controlled by a computer which would limit the total demand to 400 kW at any one time. This company has chosen to limit the use of the machines by operational policy which states that no more than two machines should be turned on at any given time. One morning at 8:00 am a new employee came in and turned on the two idle machines. At 8:30 am the plant foreman noticed that too many machines were running and quickly shut down the extra two machines. What did this employee's mistake cost the facility? Under certain conditions a customer may be able to save money by shifting to another rate category . Consider the example of a manufacturing facility which has a meter for the plant area and a separate meter for the office area. The plant is on a demand rate, but the office area is on a non-demand rate since it has a typical demand of around 19 kW for any month. Under the demand rate structure in section 3.6 customers are billed on the demand rate for one full year starting from any month in which their demand exceeds 20 kW for any 30 minute time window. If the office area could establish a very short peak demand of 20 kW or greater for one month it would automatically be shifted to the demand rate, and could likely benefit from the lower cost per kWh on that rate. Many utility rate structures include incentives and rebates for customers to replace old, energy inefficient equipment with newer, more energy efficient models. Utilities offer such incentives and rebates because it is cheaper for them to save the energy and capacity for new customers than it is to build new power plants or new gas pipelines to supply that additional load. In addition, stringent environmental standards in some areas makes it almost impossible for electric utilities to build and operate new facilities—particularly those burning coal. Helping customers install more energy efficient electrical and gas equipment allows utilities to delay the need for new facilities, and to reduce the emissions and fuel purchases for the units they do operate. Direct incentives may be in the form of low interest loans that can be paid back monthly with energy savings resulting from the more efficient equipment. Incentives may also be in the form of lower rates for the electricity used to run higher efficiency lights and appliances, and more efficient process equipment. Other incentives include free audits from the utilities and free technical assistance in identifying and installing these energy efficiency improvements. Rebates are probably the most common method that utilities use to encourage customers to install high efficiency appliances and process equipment. Utilities sometimes offer a rebate tied to the physical device— such as $1.00 for each low-wattage fluorescent lamp used or $10.00 per horsepower for an efficient electric motor. Other rebates are offered for reductions in demand—such as $250 for each kW of demand that is eliminated. Metering or other verification techniques may be needed to insure that the proper kW reduction credit is given to the customer. The load management rate structure shown in Figure 3-7 is a form of rebate for residential customers. Incentives or rebates can substantially improve the cost effectiveness of customer projects to replace old devices with new, high efficiency equipment. In some cases, the incentives or rebates may be great enough to completely pay for the difference in cost in putting in a high efficiency piece of equipment instead of the standard efficiency model. Subsequent chapters provide additional discussion and examples of utility incentives and rebates, and how they affect equipment replacement decisions. Within a short time of the passage of the national Energy Policy Act of 1992 (EPACT), electric utility interest in DSM programs and levels of rebates and incentives began to decline. EPACT contained a provision that mandated open transmission access—that is, requiring competing utilities to open up their transmission systems to wholesale transactions and wholesale wheeling of power between utilities. EPACT left the issue of retail access—or retail wheeling—in the hands of individual state regulatory agencies. However, EPACT left no doubt that utility deregulation and competition was coming. Within two years of the passage of EPACT, a dozen or more states were actively pursuing retail wheeling experiments or retail wheeling legislation. Utilities quickly began to restructure their businesses, and began massive cost reductions. The utilities were preparing for becoming the "lowest cost supplier" to their customers, and they feared that some other utility might have lower costs and could eventually capture many of their largest and most lucrative customers. DSM programs were scaled back by most utilities, and were eliminated by others. Rebates and incentives were reduced or eliminated by many utilities, as these were perceived as unnecessary costs and activities in the face of the coming deregulation and retail wheeling. A number of utilities have kept their rebates or incentives, so some of these are still available. Utility restructuring initially proceeded at a fast pace in those states with high electricity prices, and at a much slower pace in states with low prices. California, New York and Massachusetts had some of the most advanced restructuring plans as of early 1997. California had a restructured competitive market by March 1, 1998. New York had wholesale competition in early 1997 and retail access in early 1998. Massachusetts had retail choice in January 1998. Vermont was not far behind. However, events of 2000 and 2001 greatly dampened the enthusiasm for restructuring or deregulation, when western state energy price spikes and shortages occurred. Several energy supply companies were found to have created artificial shortages and supply restrictions. As a result, many states delayed, suspended or repealed their legislation and rules on customer choice of their electric supplier. In September 2001, California suspended its retail access policy, and is not expected to have a replacement policy until the time frame of 2006-2008. Even talk of federal "re-regulation" has been common. However, eventually, many of the same marketing features available for years in deregulated natural gas purchasing will become available for purchasers of electric power. These include the use of brokers, power marketers and risk managers. The brokers will arrange for the purchase of power for customers and the purchase and sale of power for customers who are self-generators. Power marketers will purchase the rights to certain amounts of electric power and will then re-sell it to other purchasers. Risk managers will basically sell futures contracts to help purchasers achieve stable longer-term prices. This eventual move to deregulation and retail wheeling will have a significant effect on future electricity prices for all large customers. Prices will decline for all large customers, and will decline significantly for many larger facilities. Instead of projecting higher electric costs in the future, these customers should be projecting lower costs. Medium-sized customers should also see cost reductions. The impact on small customers— particularly residential customers—is still unknown in most cases. Some will also see lower prices, but some are likely to actually experience price increases. In the near term, some energy managers for larger and medium-sized organizations may find themselves more involved with utility programs to provide lower cost electricity than with programs to save energy and demand. Some energy efficiency projects may even have to wait for approval until the final economic analysis can be calculated with the new cost of electricity. However, when the pricing of electricity settles down to its final range in the near future, energy managers will find themselves back in the previous business of finding ways to implement new equipment and processes to save energy and demand. 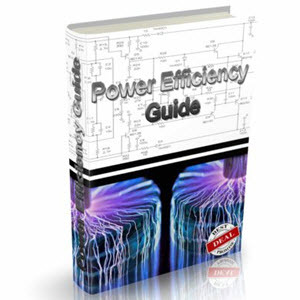 In this chapter we analyzed rate schedules and costs for electricity in detail. We also examined rates and costs for natural gas, coal, fuel oil, steam, and chilled water. A complete understanding of all the rate schedules is vital for an active and successful energy management program. In the past, few managers have understood all of the components of these rate schedules, and very few have even seen their own rate schedules. The future successful manager will not only be familiar with the terms and the schedules themselves, but he or she will also likely work with utilities and rate commissions toward fair rate-setting policies. 1. Resource: An Encyclopedia of Utility Industry Terms, Pacific Gas and Electric Company, San Francisco, CA, 1985. 2. Capehart, Barney L. and John F. Mahoney, "Minimizing Commercial Electric Bills Through Choice of Rate Structures," Strategic Planning and Energy Management, Vol. 9, No. 2, 1989. Heath and Company, Lexington, MA, 1983. Berg, Sanford V. and John Tschirhart, Natural Monopoly Regulation: Principles and Practices, Cambridge University Press, 1988. Bonbright, James C., Albert L. Danielson, and David B. Kamerschen, Principles of Public Utility Rates, Public Utility Reports, Inc., Arlington, VA, 1988. Finance, Prentice-Hall, Inc., Englewood Cliffs, NJ, 1982. Zajac, Edward E., Fairness or Efficiency—An Introduction to Public Utility Pricing, Ballinger Publishing Co., Cambridge, MA, 1978.